The avant-garde (from French, "advance guard" or "vanguard", literally "fore-guard") are people or works that are experimental, radical, or unorthodox, with respect to art, culture, and society. It may be characterized by nontraditional, aesthetic innovation and initial unacceptability, and it may offer a critique of the relationship between producer and consumer. The avant-garde pushes the boundaries of what is accepted as the norm or the status quo, primarily in the cultural realm. The avant-garde is considered by some to be a hallmark of modernism, as distinct from postmodernism. Many artists have aligned themselves with the avant-garde movement and still continue to do so, tracing a history from Dada through the Situationists to postmodern artists such as the Language poets around 1981. The avant-garde also promotes radical social reforms. It was this meaning that was evoked by the Saint Simonian Olinde Rodrigues in his essay "L'artiste, le savant et l'industriel" ("The artist, the scientist and the industrialist", 1825), which contains the first recorded use of "avant-garde" in its now customary sense: there, Rodrigues calls on artists to "serve as [the people's] avant-garde", insisting that "the power of the arts is indeed the most immediate and fastest way" to social, political and economic reform. Several writers have attempted, with limited success, to map the parameters of avant-garde activity. The Italian essayist Renato Poggioli provides one of the best-known analyses of vanguardism as a cultural phenomenon in his 1962 book Teoria dell'arte d'avanguardia (The Theory of the Avant-Garde). Surveying the historical, social, psychological and philosophical aspects of vanguardism, Poggioli reaches beyond individual instances of art, poetry, and music to show that vanguardists may share certain ideals or values which manifest themselves in the non-conformist lifestyles they adopt: He sees vanguard culture as a variety or subcategory of Bohemianism. Other authors have attempted both to clarify and to extend Poggioli's study. The German literary critic Peter Bürger's Theory of the Avant-Garde (1974) looks at the Establishment's embrace of socially critical works of art and suggests that in complicity with capitalism, "art as an institution neutralizes the political content of the individual work". Bürger's essay also greatly influenced the work of contemporary American art-historians such as the German Benjamin H. D. Buchloh (born 1941). Buchloh, in the collection of essays Neo-avantgarde and Culture Industry (2000) critically argues for a dialectical approach to these positions. Subsequent criticism theorized the limitations of these approaches, noting their circumscribed areas of analysis, including Eurocentric, chauvinist, and genre-specific definitions. The concept of avant-garde refers primarily to artists, writers, composers and thinkers whose work is opposed to mainstream cultural values and often has a trenchant social or political edge. Many writers, critics and theorists made assertions about vanguard culture during the formative years of modernism, although the initial definitive statement on the avant-garde was the essay Avant-Garde and Kitsch by New York art critic Clement Greenberg, published in Partisan Review in 1939. As the essay’s title suggests, Greenberg argued that vanguard culture has historically been opposed to "high" or "mainstream" culture, and that it has also rejected the artificially synthesized mass culture that has been produced by industrialization. Each of these media is a direct product of Capitalism—they are all now substantial industries—and as such they are driven by the same profit-fixated motives of other sectors of manufacturing, not the ideals of true art. For Greenberg, these forms were therefore kitsch: phony, faked or mechanical culture, which often pretended to be more than they were by using formal devices stolen from vanguard culture. 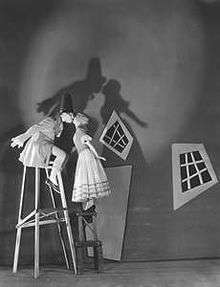 For instance, during the 1930s the advertising industry was quick to take visual mannerisms from surrealism, but this does not mean that 1930s advertising photographs are truly surreal. On the contrary, they express a style without underlying substance. In this sense Greenberg carefully distinguished true avant-garde creativity from the market-driven fashion change and superficial stylistic innovation that are sometimes used to claim privileged status for these manufactured forms of the new consumer culture. 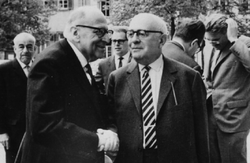 Max Horkheimer (front left), Theodor Adorno (front right), and Jürgen Habermas in the background, right, in 1965 at Heidelberg, West Germany. Various members of the Frankfurt School argued similar views: thus Theodor Adorno and Max Horkheimer in their essay The Culture Industry: Enlightenment as Mass-Deception (1944), and also Walter Benjamin in his highly influential "The Work of Art in the Age of Mechanical Reproduction" (1936). Where Greenberg used the German word kitsch to describe the antithesis of avant-garde culture, members of the Frankfurt School coined the term "mass culture" to indicate that this bogus culture is constantly being manufactured by a newly emerged culture industry (comprising commercial publishing houses, the movie industry, the record industry, and the electronic media). They also pointed out that the rise of this industry meant that artistic excellence was displaced by sales figures as a measure of worth: a novel, for example, was judged meritorious solely on whether it became a best-seller, music succumbed to ratings charts and to the blunt commercial logic of the Gold disc. In this way the autonomous artistic merit so dear to the vanguardist was abandoned and sales increasingly became the measure, and justification, of everything. Consumer culture now ruled. The avant-garde's co-option by the global capitalist market, by neoliberal economies, and by what Guy Debord called The Society of the Spectacle, have made contemporary critics speculate on the possibility of a meaningful avant-garde today. Paul Mann's Theory-Death of the Avant-Garde demonstrates how completely the avant-garde is embedded within institutional structures today, a thought also pursued by Richard Schechner in his analyses of avant-garde performance. Despite the central arguments of Greenberg, Adorno and others, various sectors of the mainstream culture industry have co-opted and misapplied the term "avant-garde" since the 1960s, chiefly as a marketing tool to publicise popular music and commercial cinema. It has become common to describe successful rock musicians and celebrated film-makers as "avant-garde", the very word having been stripped of its proper meaning. Noting this important conceptual shift, major contemporary theorists such as Matei Calinescu in Five Faces of Modernity: Modernism, Avant-garde, Decadence, Kitsch, Postmodernism (1987), and Hans Bertens in The Idea of the Postmodern: A History (1995), have suggested that this is a sign our culture has entered a new post-modern age, when the former modernist ways of thinking and behaving have been rendered redundant. Nevertheless, an incisive critique of vanguardism as against the views of mainstream society was offered by the New York critic Harold Rosenberg in the late 1960s. Trying to strike a balance between the insights of Renato Poggioli and the claims of Clement Greenberg, Rosenberg suggested that from the mid-1960s onward progressive culture ceased to fulfill its former adversarial role. Since then it has been flanked by what he called "avant-garde ghosts" to the one side, and a changing mass culture on the other, both of which it interacts with to varying degrees. This has seen culture become, in his words, "a profession one of whose aspects is the pretense of overthrowing it". Avant-garde in music can refer to any form of music working within traditional structures while seeking to breach boundaries in some manner. The term is used loosely to describe the work of any musicians who radically depart from tradition altogether. By this definition, some avant-garde composers of the 20th century include Arnold Schoenberg, Charles Ives, Igor Stravinsky, Anton Webern, George Antheil (in his earliest works only), Alban Berg, Henry Cowell (in his earliest works), Philip Glass, Harry Partch, John Cage, Morton Feldman, Richard Strauss (in his earliest work), Karlheinz Stockhausen, Edgard Varèse, and Iannis Xenakis. Although most avant-garde composers have been men, this is not exclusively the case. Women avant-gardists include Pauline Oliveros, Diamanda Galás, Meredith Monk, and Laurie Anderson. There is another definition of "Avant-gardism" that distinguishes it from "modernism": Peter Bürger, for example, says avant-gardism rejects the "institution of art" and challenges social and artistic values, and so necessarily involves political, social, and cultural factors. According to the composer and musicologist Larry Sitsky, modernist composers from the early 20th century who do not qualify as avant-gardists include Arnold Schoenberg, Anton Webern, and Igor Stravinsky; later modernist composers who do not fall into the category of avant-gardists include Elliott Carter, Milton Babbitt, György Ligeti, Witold Lutosławski, and Luciano Berio, since "their modernism was not conceived for the purpose of goading an audience." Whereas the avant-garde has a significant history in 20th-century music, it is more pronounced in theatre and performance art, and often in conjunction with music and sound design innovations, as well as developments in visual media design. There are movements in theatre history that are characterized by their contributions to the avant-garde traditions in both the United States and Europe. Among these are Fluxus, Happenings, and Neo-Dada. 1 2 "Avant-garde". Dictionary.com. Lexico Publishing Group, LLC. Retrieved 2007-03-14. 1 2 Picchione, John (2004). The New Avant-garde in Italy: Theoretical Debate and Poetic Practices. University of Toronto Press. p. 64. ISBN 978-0-8020-8994-6. ↑ Matei Calinescu (1987). The Five Faces of Modernity: Modernism, Avant-Garde, Decadence, Kitsch, Postmodernism. Duke University Press. p. .
↑ Renato Poggioli (1981). The Theory of the Avant-Garde. Belknap Press of Harvard University Press. ISBN 0-674-88216-4. , translated from the Italian by Gerald Fitzgerald, 2nd ed. ↑ Peter Bürger (1974). Theorie der Avantgarde. Suhrkamp Verlag. English translation (University of Minnesota Press) 1984: 90. ↑ Benjamin Buchloh (2001). Neo-avantgarde and Culture Industry: Essays on European and American Art from 1955 to 1975. Cambridge: MIT Press. ISBN 0-262-02454-3. ↑ James M. Harding: Cutting Performances: Collage Events, Feminist Artists, and the American Avant-Garde (Ann Arbor: University of Michigan Press, 2010): . ↑ Clement Greenberg. "Avant-Garde and Kitsch". ↑ Richard Schechner, "The Conservative Avant-Garde." New Literary History 41.4 (Autumn 2010): 895–913. ↑ Calinescu 1987,; Bertens 1995. ↑ Harold Rosenberg (1983). The De-Definition of Art: Action Art to Pop to Earthworks. Chicago University Press. ISBN 0-226-72673-8. Originally published: New York: Horizon Press, 1972; reprinted New York: Collier Books, 1973. ↑ George Dickie (1975). Edward Kamarck (ed. ), ed. "Symposium on Marxist aesthetic thought: commentary on the papers by Rudich, San Juan, and Morawski". Arts in Society: Art and Social Experience: Our Changing Outlook on Culture. 12 (2 (Summer–Fallz)): 232. 1 2 Jim Samson, "Avant garde", The New Grove Dictionary of Music and Musicians, second edition, edited by Stanley Sadie and John Tyrrell (London: Macmillan Publishers, 2001). 1 2 3 Larry Sitsky, Music of the Twentieth-Century Avant-Garde: A Biocritical Sourcebook (Westport, Conn: Greenwood Press, 2002), xiv. ISBN 0-313-29689-8. ↑ Larry Sitsky, Music of the Twentieth-Century Avant-Garde: A Biocritical Sourcebook (Westport, Conn: Greenwood Press, 2002), 222. ISBN 0-313-29689-8. 1 2 Larry Sitsky, Music of the Twentieth-Century Avant-Garde: A Biocritical Sourcebook (Westport, Conn: Greenwood Press, 2002), 50. ISBN 0-313-29689-8. ↑ Larry Sitsky, Music of the Twentieth-Century Avant-Garde: A Biocritical Sourcebook (Westport, Conn: Greenwood Press, 2002), xiii–xiv. ISBN 0-313-29689-8. ↑ Larry Sitsky, Music of the Twentieth-Century Avant-Garde: A Biocritical Sourcebook (Westport, Conn: Greenwood Press, 2002), xvii. ISBN 0-313-29689-8. ↑ Larry Sitsky, Music of the Twentieth-Century Avant-Garde: A Biocritical Sourcebook (Westport, Conn: Greenwood Press, 2002), xv. ISBN 0-313-29689-8. Daly, Selina, and Monica Insinga (eds.). 2013. The European Avant-garde: Text and Image. Newcastle upon Tyne: Cambridge Scholars. ISBN 978-1443840545. Fernández-Medina, Nicolás, and Maria Truglio (eds.). Modernism and the Avant-garde Body in Spain and Italy. Routledge, 2016. Harding, James M., and John Rouse, eds. Not the Other Avant-Garde: The Transnational Foundations of Avant-Garde Performance. University of Michigan, 2006. Léger, Marc James (ed.). 2014. The Idea of the Avant Garde—And What It Means Today. Manchester and New York: Manchester University Press; Oakland: Left Curve. ISBN 9780719096914. Mann, Paul. The Theory-Death of the Avant-Garde. Indiana University Press, 1991. Roberts, John. 2015. Revolutionary Time and the Avant-Garde. London and New York: Verso. ISBN 9781781689127 (cloth); ISBN 9781781689134 (pbk). Schechner, Richard. "The Five Avant-Gardes or ... [and] ... or None?" The Twentieth-Century Performance Reader, 2nd ed., ed. Michael Huxley and Noel Witts (New York and London: Routledge, 2002). Sell, Mike. The Avant-Garde: Race, Religion, War. Seagull Books, 2011.